Asparagus x 1 bundle Brussel Sprouts x 1.5 lbs. Cherry Tomatoes Garlic Green Onions x 1 bunch Lemon x 1 Parsley x 1 bunch (for the quesadillas) Parsley x 1 bunch (for the salad) Shallot Spring Mix, Baby Kale, or Romaine x 5 oz. Strawberries x 1 pt. Butter, unsalted Chicken Thighs, boneless x 1.5 lbs. Eggs Feta x 3 oz. Manchego x 4 oz. You’ve likely gathered by now that I am in for all things taco, enchilada, burrito bowl etc., but I do burn out on the same flavors in those things. 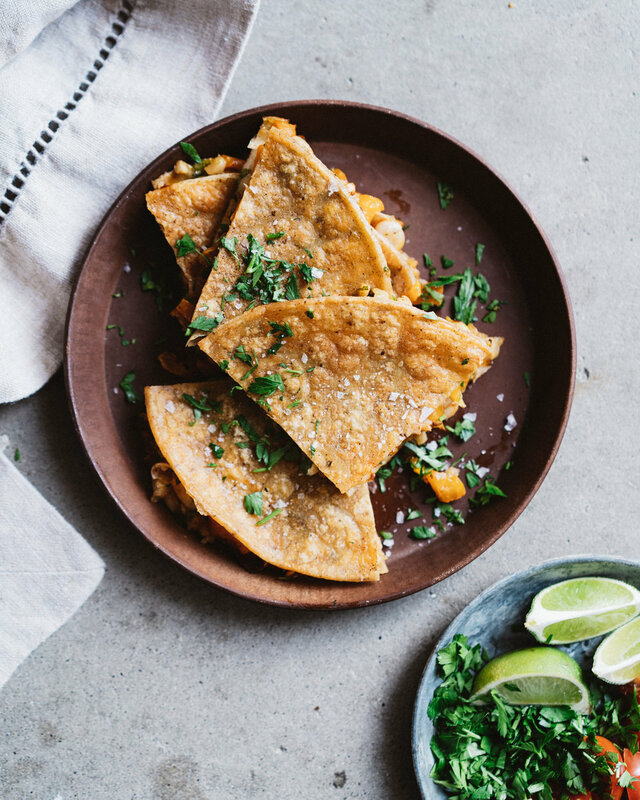 I took a note from Anna Jones of A Modern Way to Cook, and tried her Spanish-spin on a quesadilla. The beans help make these creamy without using an obscene amount of cheese. A happy hour contribution, or easy vegetarian meal, these are easy and delicious. They can be bulked up with some added protein. If you go that route, I suggest using larger tortillas, as they fill up quickly. Make Ahead: Prep the quesadilla filling a day in advance and keep it covered in the fridge. Use it Twice: The same filling would be great in a grilled cheese or on top of crostini and used as an appetizer. You could warm them just slightly to get the cheese melty. Kid Friendly: I went the grilled cheese route and added chicken for my kids. I knew changing up their traditional, beloved quesadillas would be met with resistance, but between slices of bread and toasted, it went alright. Carnivore Addition: Add grilled chicken or steak, and perhaps use a larger sized tortilla. Gluten Free: Use corn or cassava tortillas. 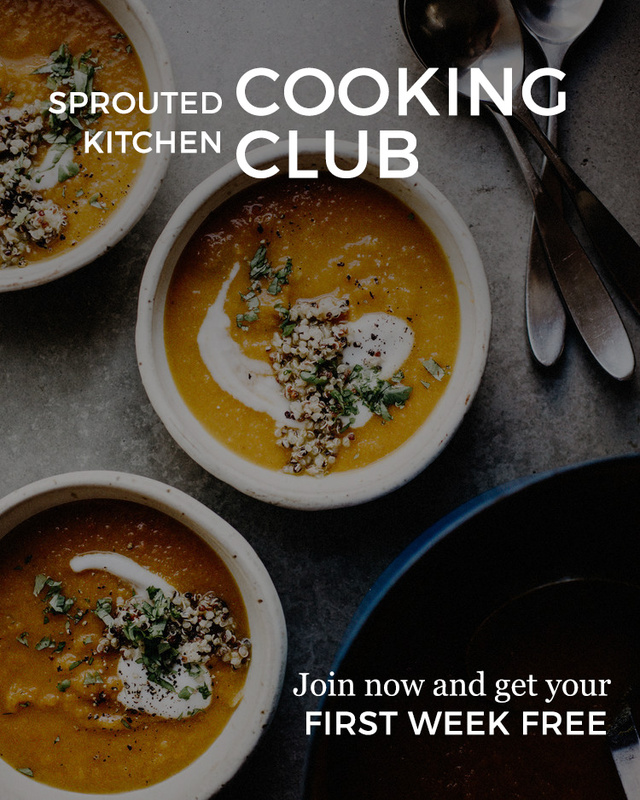 Dairy Free: I have recently been trying to almond-based shredded “cheese” from Trader Joes and, while it tastes nothing like real cheese, with the other spices here, it works as a glue to the tortilla that is better than no cheese. Slice the green onions. Heat a frying pan over medium heat, add the olive oil, sliced green onions, paprika, and cook for a few minutes until browned. In a mixing bowl, add the white beans, and mash them up a bit with the back of a fork. Drain and chop the roasted peppers and add them to the bowl. Grate in the lemon zest, add the parsley, and grated manchego. Add the green onions to the mixture and put the pan back on the stove. In a separate hot pan, add the tortilla and a few spoonfuls of the pepper bean mixture. Spread it around to the edges. Sprinkle on a few cherry tomatoes and any protein if using. Top with another tortilla, and fry for a few minutes on each side. Remove to cool slightly before cutting and serving. This recipe requires some multi-tasking, and I hope I wrote it in a way that is easy to understand. While the brussels roast, start your glaze, then the chicken, then go back to the brussels, then finish the chicken. Promise it’s easier than it looks in writing. Just read through the recipe before starting. Chicken thighs turn out more moist for us, but I know tenders and breasts are preferred by some. If you go this route, just reduce the cooking time by a couple minutes. Get a good hot sear to start, then use a lower heat so you don’t cook it to death. 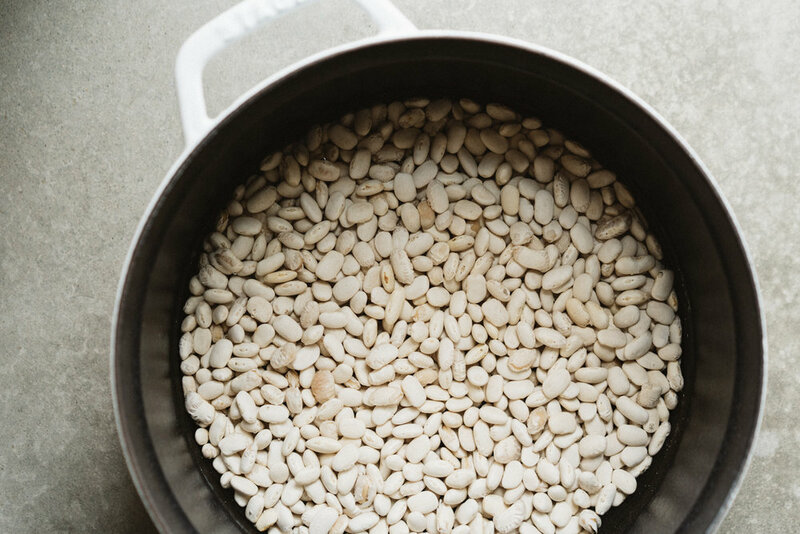 Serve this with your favorite cooked grain. Make Ahead: The brussels and glaze can be prepared in advance. Kid Friendly: These brussels are amazing, but skip the pepper flakes for picky kids. We also add some rice to fill the meal out for the kids. Vegetarian Swap: Use tofu or tempeh in place of the chicken. Otherwise, serve the brussels over brown rice or other whole grain. 8 chicken thighs, boneless (skin on or off to your preference) about 1.5 lbs. Salt and pepper the chicken on all sides and let it sit for 10 minutes. Preheat the oven to 425’ and preheat the roasting pan along with it. Toss the brussels in the oil, salt and pepper. Transfer the brussels to the hot pan, and roast for 20 minutes. While they roast, first start the honey glaze for the Brussels. Pour the honey in a small saucepan, and simmer gently for about 5 minutes. Add the vinegar, let it bubble, and then calm down. Stir in the butter, pepper flakes, a pinch of salt, and set it aside until the brussels are finished. Right after you pull them from the oven, toss them in the glaze and garnish with green onions. While the brussels roast, and your glaze is simmering, start your chicken. Heat a slick of oil in a large pan over medium heat. Add the chicken and let it cook until browned on one side, about 4 minutes. If using skin-on, fry with the skin side down. Flip the chicken, add the broth, put the cover on ajar, and let the chicken cook another 7 minutes. Remove the lid, push the chicken over to one side, and add the butter, mustard and garlic so it hits the heat of the pan to warm and become fragrant. Spoon the sauce over the chicken thighs just to glaze. Cook for another minute or two, depending on the thickness of the chicken. Take them off the heat to rest a minute. If you have not already done so, toss the brussels in the glaze, and finish with the green onions. 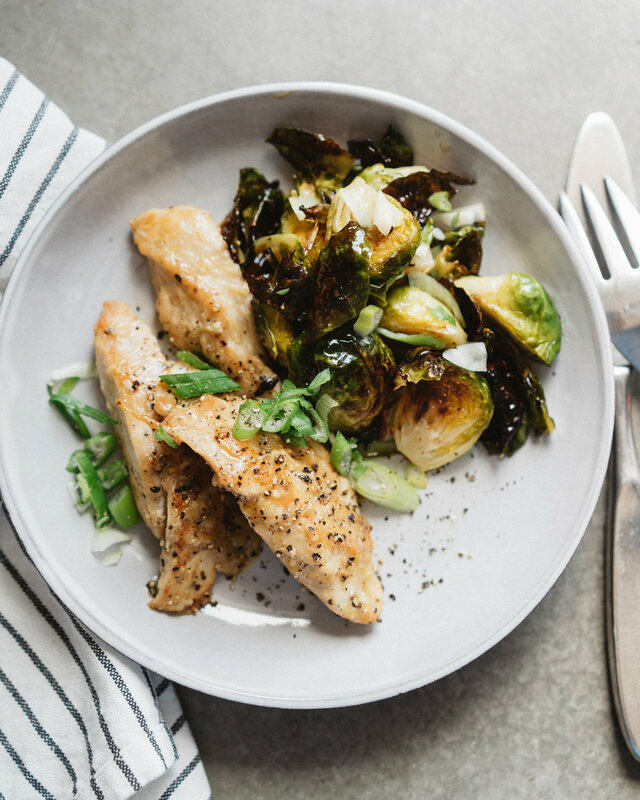 Serve the chicken with a portion of brussels. I know we are spread all over as far as demographics are concerned, but we have strawberries at our local farm, so I had to include them. If good quality berries are not available near you yet, pears or apples will do. I do not like raw asparagus, but if you don’t mind it, you can skip the quick roast. Add white beans, hard boiled eggs, salmon, or chicken to make this a more filling meal. Make Ahead: The vinaigrette can be made a few days in advance and brought to room temperature before using. The asparagus can also be quick roasted in advance. If you are adding protein, you can also cook that in advance. Use it Twice: It’s nice to have extra vinaigrette for easy salads throughout the week. Make extra asparagus coins, they are great folded into scrambled eggs. Kid Friendly: I keep the ingredients more composed and skip the lettuce for the kids. Carnivore Addition: Add grilled chicken or salmon. Preheat the oven to 450’. For the vinaigrette, this can all be blitzed in a food processor or made by hand. Chop the walnuts well and put them in a bowl with the vinegar, mustard, shallot, parsley, salt and pepper. Stir to mix (alternatively, blitz these things in a food processor). Whisk while drizzling in the olive oil and set aside. Trim the tips from the asparagus, and chop the rest into 1/2” coins. Spare the woodsy ends (usually the last 1/4 of the asparagus). Toss the pieces in a light drizzle of olive oil and a pinch of salt and pepper. Spread them on a rimmed baking sheet and roast for just 7 minutes until barely tender. Set aside to cool. Mix the greens in a few spoonfuls of the vinaigrette. 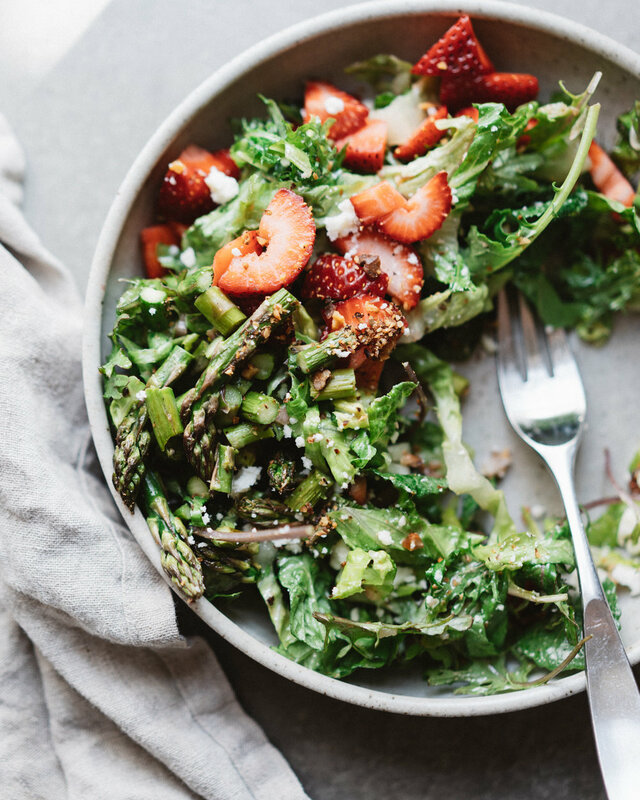 Arrange your bowls with the dressed greens, asparagus, strawberries and a sprinkle of cheese on top. One of our favorite cookies are the chocolate chippers from Tara O’ Brady. You barely brown the butter first and the sugar melts a bit, leaving you with a silky, buttery cookie. My one change, by way of personal preference, is slightly less baking powder and soda, as I prefer a flatter cookie to a poofy one. “Scant” means “just slightly less than the listed measurement”. You can add nuts, toasted coconut or use half whole wheat flour if you please. Both a gluten-free all-purpose or non-dairy butter should work here in equal swaps. Make Ahead: The dough can be made up to two days in advance and kept covered in the fridge. You can also keep frozen balls of dough in the freezer and thaw them slightly while your oven preheats when you’re ready to eat. This helps with portion control. In a small saucepan, warm the butter. We don’t want it sputtering, just a little murmur. Swirl the pan occasionally until the butter is just barely toasted. You should smell it (heaven! ), around 8 minutes. Transfer the butter to your stand mixer or large mixing bowl. Add both sugars to the butter and mix well. Add the egg, vanilla, and mix again. A pro would tell you to stir the dry ingredients separately, but I just add them to the mixer and hope for the best. You choose. Add the flour, oats, salt, baking soda, baking powder, and give it a mix to *just* combine. Add the chopped chocolate and give it one more stir to combine. Let the dough rest while you preheat the oven to 360’. Scoop the dough into small balls and line them on your baking sheets with a few inches between for spreading. Bake the cookies for 10 minutes, rotating the baking sheets halfway between. They will look underdone, but promise you they'll be perfect after you let them cool. Keep the cookies stored in an airtight container.